The incidence of cerebral venous thrombosis is 0.67 per 100,000 children per year. The diagnosis is often delayed or missed because the signs and symptoms are nonspecific. Most of the children with cerebral venous thrombosis have an underlying chronic disease and those who are previously well have an acute infectious illness. Prothrombotic disorders are also important risk factors for the development of cerebral venous thrombosis. Obstructive hydrocephalus as a complication of cerebral venous thrombosis is rare and few cases are described. 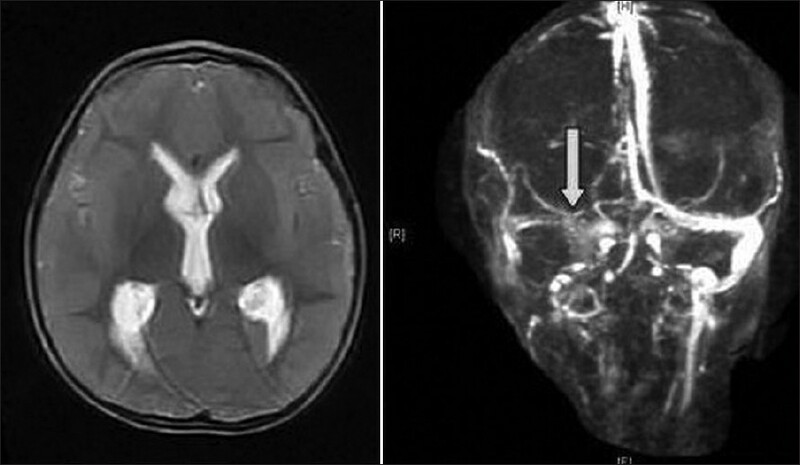 A previously healthy 4-year-old boy presented with 5 days of headache and vomiting. Past medical history revealed no abnormality. On initial presentation he was lethargic with no lateralizing neurological deficit. Meningeal irritation signs were negative. Deep tendon reflexes were hyperactive and ophthalmological examination revealed bilateral papilledema. Magnetic resonance imaging of the patient revealed obstructive hydrocephalus and magnetic resonance venography revealed thrombosis of the right transverse sinus [Figure 1]. Low molecular weight heparin was started at a dosage of 1 mg/kg twice a day. Etiologic investigations revealed that the patient has homozygous MTHFR 1298 polymorphism. Echocardiography was normal. On the following days the patient had a marked improvement and was discharged from the hospital without a neurological sequel. 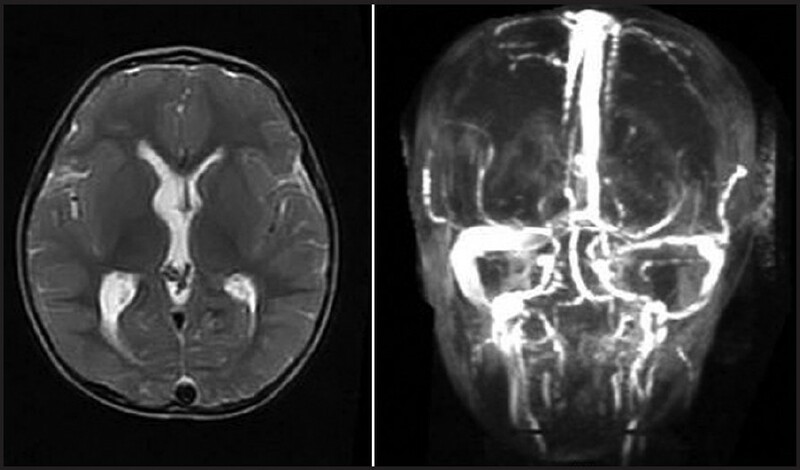 Control magnetic resonance imaging and magnetic resonance venography 1 month after the first event revealed partial resolution of hydrocephalus along with recanalization of the affected sinus [Figure 2]. After a month of heparin therapy with folic acid and vitamin B6 and B12 replacement, the follow-up of the patient was given up by the family and he did not receive any treatment for 5 months. Six months after the first event, the patient was again admitted to hospital with a similar clinical picture along with new thrombosis at the sagittal sinus. Low molecular weight treatment resulted in sinus recanalization and recovery of hydrocephalus. The patient is still followed up with low molecular weight heparin treatment after the second thrombosis attack. The etiologies regarding cerebral venous thrombosis are diverse and include head and neck infections and chronic disorders such as collagen tissue disorders, cardiac disease, and hematological abnormalities. Half of the patients have prothrombotic states which include anticardiolipin antibodies, deficiencies of protein C and S, antithrombin III and prothrombotic gene mutations such as prothrombin 20210, factor V Leiden, and MTHFR mutations. The most frequent two common MTHFR polymorphisms are C677T (alanin to valin transition) and A1298C (glutamine to alanine transition). The relationship between MTHFR polymorphism and cerebral venous thrombosis is not well defined. Evaluation of nine case control studies with total 382 patients having cerebral venous thrombosis revealed that carrying MTHFR was not a risk factor for cerebral venous thrombosis. On the contrary a Canadian study revealed that 29% of patients with cerebral venous thrombosis had MTHFR polymorphisms. Our case had a prothrombotic state with MTHFR 1298 homozygous polymorphism without any risk factors. Occurrence of clinical findings after cessation of heparin treatment suggests that MTHFR polymorphism may be an important risk factor for cerebral venous thrombosis. Indications for anticoagulation treatment for cerebral venous thrombosis are not clearcut. Anticoagulation is not recommended for asymptomatic and hemorrhagic cases. When used, low molecular weight heparin is the standard anticoagulant treatment in children. Treatment may last for 3-6 months or it may be continued until recanalization if risk factors are eliminated. Our patient responded well to low molecular weight heparin with recanalization of sinuses and recovery of hydrocephalus in both the attacks. In conclusion cerebral venous thrombosis must be kept in mind in children with acute hydrocephalus. MTHFR 1298 polymorphism may be an important risk factor and low molecular weight heparin should be the choice of treatment in cases without hemorrhage. 1. Sébire G, Tabarki B, Saunders DE, Leroy I, Liesner R, Saint-Martin C, et al. Cerebral venous sinus thrombosis in children: Risk factors, presentation, diagnosis and outcome. Brain 2005;128:477-89. 2. Yager JY, Black K, Bauman M, Massicotte P. Cerebral venous thrombosis in newborns, infants and children. Front Neurol Neurosci 2008;23:122-31. 3. Mullen MT, Sansing LH, Hurst RW, Weigele JB, Polasani RS, Messé SR. Obstructive hydrocephalus from venous sinus thrombosis. Neurocrit Care 2009;10:359-62. 4. d'Avella D, Greenberg RP, Mingrino S, Scanarini M, Pardatscher K. Alterations in ventricular size and intracranial pressure caused by sagittal sinus pathology in man. J Neurosurg 1980;53:656-61. 5. Kristensen B, Malm J, Markgren P, Ekstedt J. CSF hydrodynamics in superior sagittal sinus thrombosis. J Neurol Neurosurg Psychiatry 1992;55:287-93. 6. Gouveia LO, Canhão P. MTHFR and the risk for cerebral venous thrombosis- a meta-analysis. Thromb Res 2010;125:e153-8.